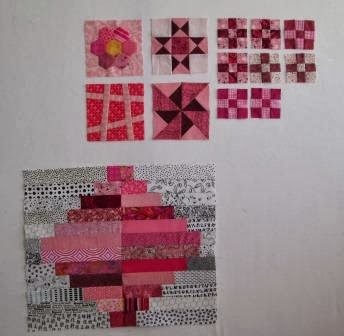 I have a few more pink sampler blocks done this week. They measure 6 1/2". I really like the bottom Right pinwheel block. I am calling this my Lanterns. I did not get the blue one done yet. I hope soon. I had a bunch of 2" strips so I think my are smaller than some peoples. Here is the full wall today. I also got a few little nine patches too. They are hard to stop making. I do not know what I will make with them but I think I have to make more nine patches. Next week will be the last Pink Saturday, so I hope to put all my pink back up on the wall, as it really looks good together. 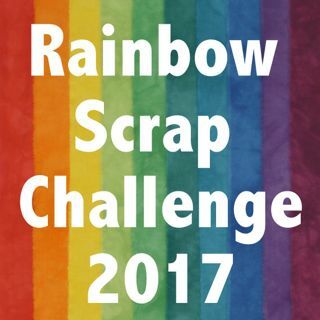 I have added this post to Soscrappy RSC 2014 this week. Go see more pink from all the others. OK I am showing off my smart puppy again. I have been working on a game called It's Your Choice. She is 3 1/2 months old, so this game takes lots of self control. She has a kibble on each front paw and more on the floor, plus a full food dish. When she is holding still and not taking food she is hand given a kibble. So you see she has to work for her supper. My husband helped take the photo as there is no way I could mange the game and the camera. Pretty pink blocks. Wow. That is a smart puppy. She has better control than I do when it comes to supper! lol. Your pinks are all so pretty together. Great blocks! I'm enjoying looking at all your fun pinks. I like the pinwheel too. And your puppy is so cute... and it looks like she's showing remarkable self control there. 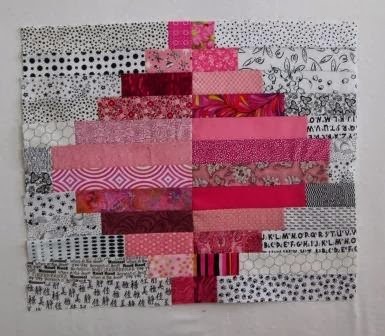 You've done some really pretty pink blocks Cathy. Your pink blocks are fabulous! I love the name Lanterns for your SS blocks :) I thought of making mine smaller - maybe even half sized - but then decided to go for the whole enchilada LOL!!! The pink blocks are very nice. I also like the pinwheel block - nice contrast. 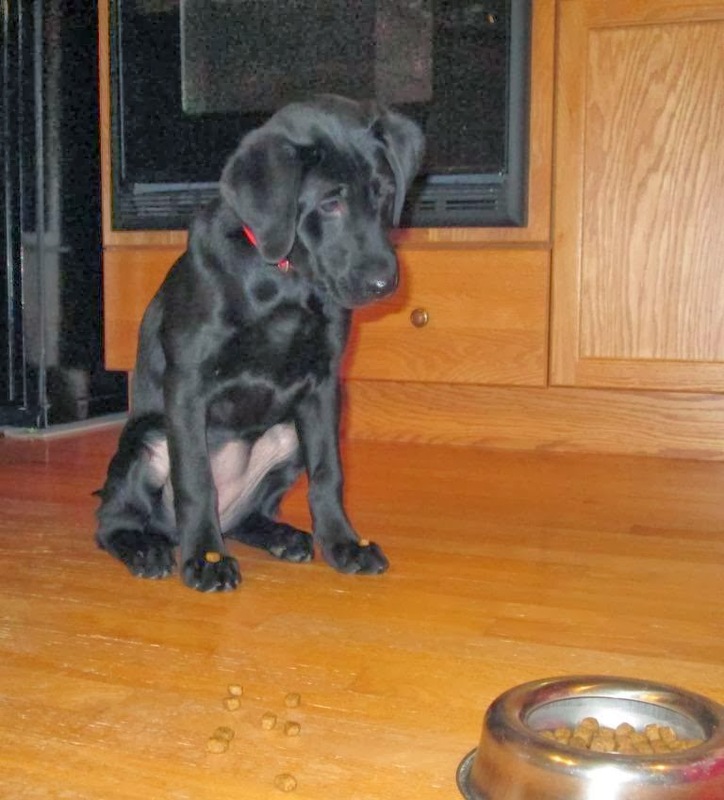 What incredible self-control your puppy displays. 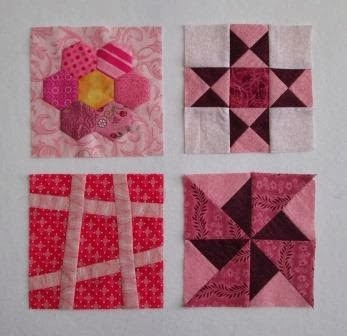 Very pretty pink blocks. Your puppy is so adorable. I love your lantern block. Gemma is one smart puppy. I can't believe she's so patient. You have been busy! Quilte put me to shame having only worked on my cats. A lovely collection of blocks there and the lantern is super. Love that you are making baby nine patches. Too cute. Great collection of sampler blocks this month. Such a cute puppy.